Composer Andrea Clearfield sought new sounds when composing her Buddhist-enlightenment opera. Here she is pictured with Tibetan instruments from her personal collection. A Philadelphia composer who was writing an opera decided that, much as she loved Western classical instruments, they wouldn’t be enough to capture “enlightenment.” So she ordered new sounds. David Patrick Stearns had a report at the Inquirer in January. “The commotion-causing opera is Mila, Great Sorcerer: It will have a semi-staged presentation Jan. 12-13  in New York City’s Prototype Festival and dramatizes a Tibetan Buddhist parable of annihilation and enlightenment. The more demonic sections have music she describes as ‘macabre circus … dark tango … a nod to the Mummers strut,’ played by Western orchestra augmented with horns, bowls, and bells from Nepal. “Yet the story — about a young man who acquires dark powers for revenge and is later transformed into one of the most venerated teachers in Tibetan Buddhism — still asked for something more. Clearfield wanted sounds she had never heard, from an ethereal tricked-out music box to a drone that suggests something primeval welling up from the center of the Earth. Instrument maker David Kontak created seven new instruments to produce them. “Even better, the libretto was commissioned by a pair of producers who originally considered a film about Mila but concluded opera would be a better way to tell the story. “As much as Clearfield and her collaborators have immersed themselves in Tibetan culture, the greatest impact on the opera itself may not be religious or even philosophical, but elemental. Bhutanese painting thanka of Milarepa [Mila]. Here Mila is listening, “reminding you to stay awake. Stay awake to your life — and move forward,” says Inquirer reporter David Patrick Stearns. Young people have fun participating in the English National Opera’s Opera Squad. “Stuart Murphy, the former channel controller of the youth channel BBC Three who joined ENO as CEO in March, said the initiative stemmed from the company’s core values. “All the free tickets will be for what might be called the cheap seats in the balcony. But ENO contends the balcony ‘is widely regarded as having acoustically the best seats in the house.’ There will also be no peering round columns as, uniquely, all seats at the Coliseum have unrestricted views of the stage. “Anyone who is under 16 will need to be accompanied by an adult. But any adult who purchases a full-price ticket in the balcony … will be able to take up to four children for free. Teachers bringing a school group can be accompanied by 10 children for free. Young people aged 16-17 can book one ticket each. “The ENO initiative will be welcomed by those who argue that the best way to get young people hooked is for them to experience the art form itself. Not sure I agree with that last comment. I was 14 at my first opera, La Bohème, and it meant nothing to me. At the very least, I think it would help if kids heard the music in the background at home or school for some days before attending a performance. I could be wrong. No doubt they will all get into Jack the Ripper without help! A German opera company invited current refugees to be part of its production of “Moses,” lending immediacy to the story of exile. Powerful stories from any century speak to the human condition in any other century. Thus, for example, the story of exile in the opera “Moses” speaks to the sense of dislocation that today’s refugees experience. To drive home that point, an opera company in Germany has invited current refugees to participate in a production. Joshua Barone reports at the New York Times, ” ‘We tell the story of Moses because it is actually our story,’ one teenager, a refugee from Afghanistan by way of Iran, said in the Hazaragi dialect to the German-speaking audience at the Bavarian State Opera here on a recent Sunday evening. “Others chimed in: ‘The story of Moses is also my story,’ they said in French, Kurdish, Greek and Arabic. “They were the cast of ‘Moses,’ a feel-good yet sobering new production by the Bavarian State Opera’s youth program, written for refugees, children of immigrants and born-and-raised Bavarians. “In the opera, a mixture of new music by Benedikt Brachtel and adapted excerpts from Rossini’s “Mosè in Egitto” [“Moses in Egypt”], the teenagers tell the story of Moses — common ground for followers of the Bible, Torah and Quran — with Brechtian interludes about refugee experiences and current events. “Ms. Glause, who had volunteered on boats in the Mediterranean, also wrote the libretto for ‘Noah,’ after interviewing many of the same young refugees who are in ‘Moses.’ She described the process — hearing stories of loss, danger and fear from teenagers — as acting as both an artist and a counselor. “Among the people she spoke with were Ali Madad Qorbani, a young man from Afghanistan who fled to Iran, then Europe, after his father had disappeared; and Zahra Akhlaqi, also from Afghanistan, whose mother came to Europe first while she and her sister waited in Iran, where, she said, they were forbidden from going to school but would dress up like students at home and play pretend. 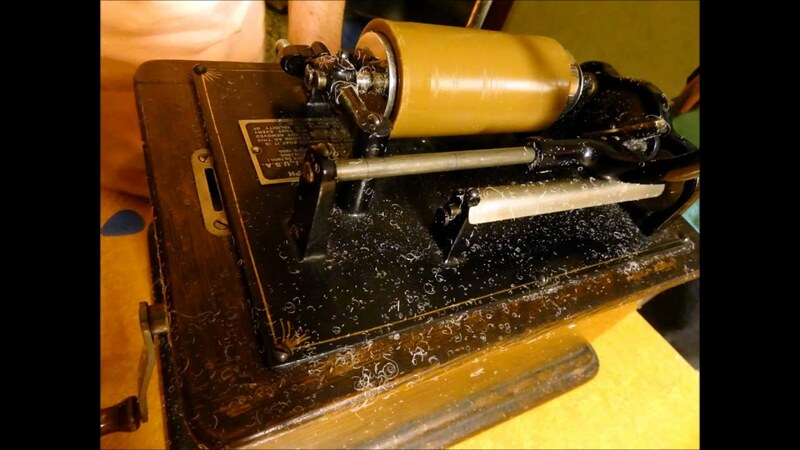 Long ago, music was recorded on a wax cylinder like this. Out of curiosity, contemporary opera singers experimented with wax recording at Lincoln Center’s New York Public Library for the Performing Arts. Once at my old job, we tried an ice-breaker game in which we said our first name and an adjective describing ourselves. My first name begins with “c,” and the first adjective that popped into my head was “curious.” Since then, I’ve often thought that was the right word for me. I am curious. And I admire people whose curiosity takes them interesting places. Recently the curiosity of a Met tenor led to a fun experiment with wax recording that you can listen to online. Anthony Tommasini writes at the New York Times, “Whenever Luciano Pavarotti was asked to name the greatest tenor ever, he always answered Enrico Caruso, who became a household name from his recordings, made from 1902 until his death in 1921. “But how did Pavarotti know? Especially on Caruso’s breakthrough records, the sound is scratchy, wiry and wobbly. The same holds true for early recordings of Nellie Melba, Luisa Tetrazzini and other luminaries of that era. While there are entrancing hints of astonishing voices, it’s hard to tell what they were really like. If only we could record a singer today on the equipment used back then and compare the playbacks to modern recordings. “Well, that precise experiment took place earlier this month at the New York Public Library for the Performing Arts at Lincoln Center, thanks to the curiosity of Piotr Beczala, a leading Met tenor. “Touring the Met’s archives a couple of years ago, Mr. Beczala mentioned that his dream was to record some arias under early-20th-century conditions. He wanted to learn firsthand how faithful — or far-off — the results would be. “Mr. Beczala was first up, singing ‘Quando le sere al placido’ from ‘Luisa Miller,’ accompanied by Gerald Moore, who played on a small upright piano so as not to compete with the voices. Putting the cylinder in place, Mr. Fabris was careful not to touch the surface: Even a slight thumbprint can create an impression. While Mr. Beczala sang, Mr. Fabris held a small brush in one hand and a little squeezable air bag in the other to disperse the dustlike shards of wax that are created when the stylus cuts into the cylinders. Read more about this at the New York Times, here, and listen to the wax cylinder recordings the experiment produced. Charlotte Hoather as Uccellina in the “BambinO” production from Scottish Opera, Improbable theater company and the Manchester International Festival. I know that babies take swimming lessons these days and yoga with Mama. I know they go to music classes (“put your instruments back in the Taster’s Choice bin before we go home”). But opera? Well, why not? Some babies are so loud everyone says they will be opera stars when they grow up. Michael Cooper, a reporter for the New York Times, wrote in March at about an opera actually designed for babies. “The average age at the Metropolitan Opera is about to get lower — much lower. Sitting still will not be required: Audience members will be encouraged to crawl around and interact with the singers if they like. The dress code will be so relaxed that many operagoers may opt for onesies. “No, the barbarians are not at the gate. The Met is presenting a new opera for babies. “ ‘In the Met’s never-ending quest to develop audiences of the future, we’ve decided to start at the very beginning,’ Peter Gelb, the Met’s general manager, said in a statement. “The opera will be performed for 25 babies, who will be seated on the laps of their caregivers on benches with cushions around the perimeter of the stage area. Changing tables and stroller parking will be provided. “The Met’s education team will work with researchers in infant development and early childhood music education from the Rita Gold Early Childhood Center at Teachers College, Columbia University.” More at the New York Times, here. Let’s hope operas for babies help build audiences for the future. “Free” is definitely the way to start.